"Eugenie Grunewald was vocally a savage Amneris, a really dangerous princess with endless power in the depths of her register, yet with a very comfortable top." "Mezzo-Soprano Eugenie Grunewald let fly with wave after wave of gutsy, commanding tone making Amneris exude haughtiness and steely determination. She made Amneris' romantic outpourings warm and alluring. "Eugenie Grunewald sang solidly as a villainous Amneris"
"Grunewald was vocally imperious as Amneris when needed, but also had the ability to sing with aching passion. Her scene outside the judgment chamber crackled with drama." "Eugenie Grunewald had all it took in spades as Amneris, She was chilling in her portrayal of treacherousness as she tricked Aida into confessing her love for Radames. But when jealousy turns to abject grief and regret when Radames is sentenced to death, our contempt turns to sympathy. It was moving - one of the reasons opera lives." Headline - "MEZZO GRUNEWALD TRIUMPHS AS AMNERIS IN WESTFIELD SYMPHONY'S AIDA." 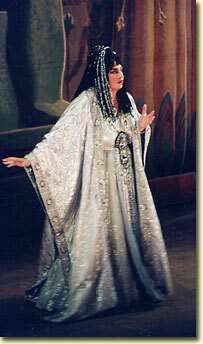 Rightfully garnering the most response from the audience was Eugenie Grunewald's Amneris. The mezzo-soprano owned the hall whenever she was on. She projected the princess sorely wounded in her love and pride, with every fiber of her being. She caressed, she quivered with rage, she demanded with passion. What temperament! Everything she touched was electric. At the conclusion of the Act IV Judgment scene, the performance stopped for a full minute while the audience gave her an ovation. Even seasoned professional musicians in the audience said they never need to hear another Amneris." 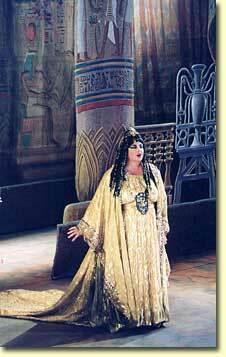 "Grunewald, singing her first Amneris anywhere displayed a voluminous mezzo-soprano that glowed in tone There is a strongly focused quality to her voice, which can cut through ensembles and the flooding sound of an orchestra. She is a mezzo to watch."